From watching Jaws for the first time to every National Geographic/Discovery Channel documentary about white sharks; I was hooked! This trip was on my hit list and 3 years in the making. My dream came true and I can honestly say through as much research as I could do, I chose the right tour to see white sharks. They are the biggest here and the visibility can not be matched anywhere else in the world. I will never forget my experience. 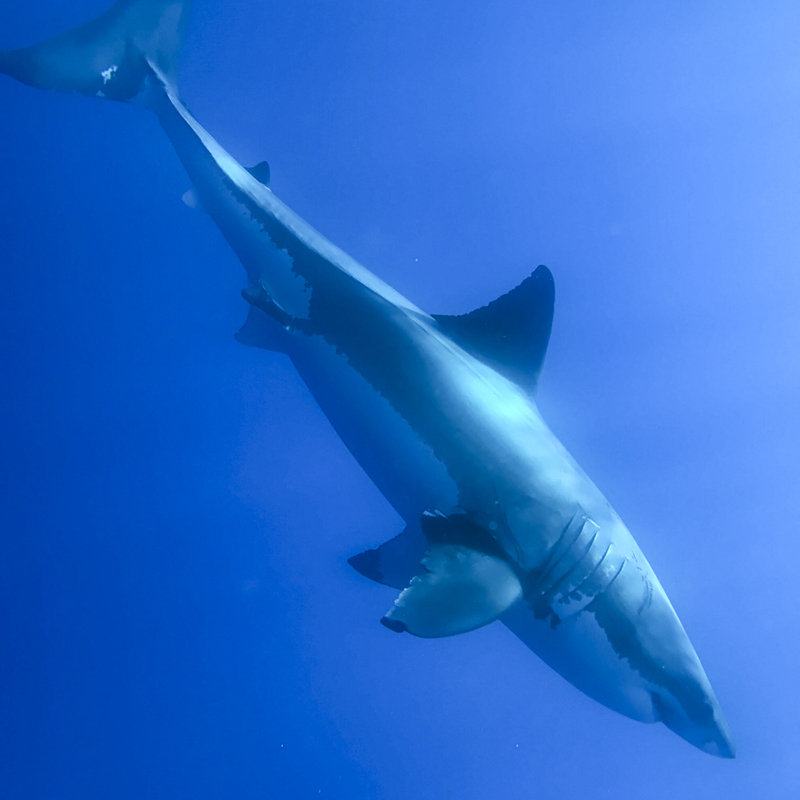 This is my third trip to Guadalupe Island, and my first on board the Nautilus Explorer. By far, this vessel exceeds all expectations. It makes other non-Nautilus vessels look like glorified fishing vessels. The Captain and entire crew is outstanding! The accommodations are exceptional. Most importantly, what stood out the most is: the respect, appreciation and compassion for the great white sharks by the dive/deck crew. I will return next year, without a doubt, on board the Nautilus Explorer. As a guest, you are very well taken care of, from clean sheets and towels, to meals on your own schedule. Pato deserves an extra kudos for adjusting my new camera’s settings to obtain the best possible photos in the cage! 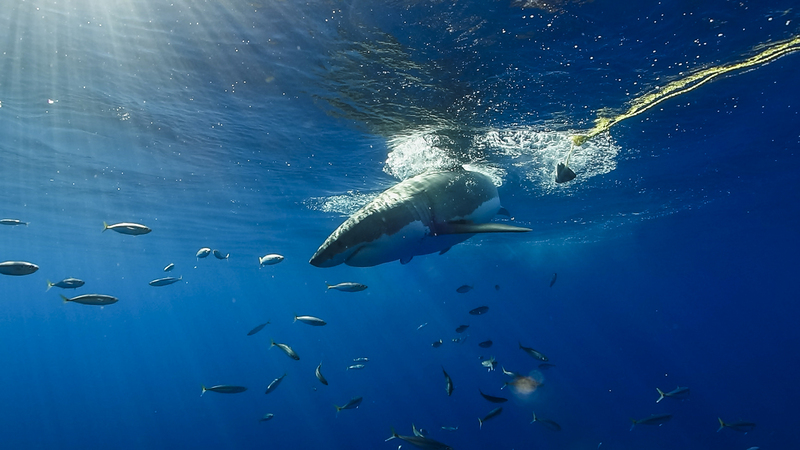 Nautilus Liveaboards has once again provided superior service and an excellent white shark experience. Daniela with her infectious smile and bubbly personality can’t help but make you feel welcome. Dulci was efficient and on the spot whenever I needed anything. All the divemasters were willing to assist with anything I might have needed on deck. The entire crew from Lowell, the captain, on down were professional and courteous. They were a “well-oiled machine.” I’ll certainly be back. A dream came true. And they make it happened. The Nautilus Explorer is a fantastic ship as a diving platform and the cabins are just super. They have all you need, and everything else from the lounge, dining place, to the sundeck are just perfect. As awesome as the BIG white sharks were, the ship was amazing. The crew are just outstanding, they are so professional and kind and service-minded, and they really pay attention to all details, and they put in all their heart and soul to make a great vacation for you. They work so hard from morning to evening with a big smile on there faces. We give the crew 6 stars out of 5. The service they gave to Kurt who is in a wheelchair is beyond what you can ask for. Thanks for making our dream come true! This trip was unforgettable, absolutely the trip of a lifetime. The amount of sharks encountered far exceeded my expectations. The boat and crew are top notch. The crew was more than helpful in making this trip an unforgettable adventure. I recommend this company and trip to anyone. This trip has lived up to everything I expected and more. The crew of the Nautilus Explorer are top notch. They treat you like Kings and Queens. They are fun to be around, and will help you with anything that you need. The sharks were the stars of the show. There was a point where we had 8 sharks at once. My head was on a swivel. I highly suggest bringing lots of film cards. The shark wrangling was amazing. Air Jaws at its best! I cannot express my gratitude enough to the crew, they know how to get these sharks around the boat. The boat itself is amazing and very comfortable. Book this trip if you get a chance, it comes highly recommended from everyone that has experienced the Nautilus Explorer and her amazing crew. I WILL be back, you can count on that. Thank you so much for this AMAZING experience of a lifetime! Peace! I will take sharks over breakfast. In the cage, as soon as they opened at 0630 the 1st shark showed up very quickly and was hungry. By noon there were 5 sharks putting on a show, very active, and aggressive after the bait. I could not stay out of the cages! I had so much great video after the 1st dive it would have been worth the trip. The divemasters were great and kept the action hot. The staff kept everyone well fed and energized. Sharks were around all day. So, plenty of opportunity for everyone to see the show. I was the 1st one in the water after a late night including identifying the days’ sharks. We may have seen a new male and female. The Mexican tacos and buckets of beer special were a great treat. The 1st submersible dive at 0800 was action packed with 2 big males putting on a show with several sneak attacks on the wranglers. I got lots of video today the friends and family may get tired of all the great video clips, and it is only day 2! The afternoon was as action packed as the morning with a big female showing up with a male right behind her, and the lighting was spectacular during the afternoon dive. Great night, awesome dinner of filet mignon or, for the vegetarians, stuffed Portabello mushrooms. YUM! The divemasters put on a great game of trivia with a lot of antics, very entertaining, and I was the champion! I won a bottle of red wine. The last day of cage diving: WOW, WOW, WOW! It was all day action. I was the 1st one in the water and on the surface it appeared nothing was happening. Then when I got in there was a sea lion using the boat as cover with 2 female great whites and 2 males hunting it. They stayed near but under the boat for awhile, and I was the only one in a cage! The day was filled with action. The 1st submersible dive had 8 to 10 sharks, BIG females and males, and it stayed like that all day. Lots of breaches, and all day to the last-minute action near the surface cages. INCREDIBLE Day. The entire staff did a wonderful job. Lots of character and interaction with the guests. AWESOME! The sharks are elegant and graceful creatures. The staff has been GREAT! Definitely is a trip of a lifetime! Fantastic end to an epic adventure! Sharks, sharks, and more sharks all day long! Every time I was in the water there were from 3-8 sharks swimming around, including a baby shark! The best part is they stayed around all day. Thank you to the wonderful crew for making this a trip I will remember forever!! After a day of traveling, everyone was nervous and excited. 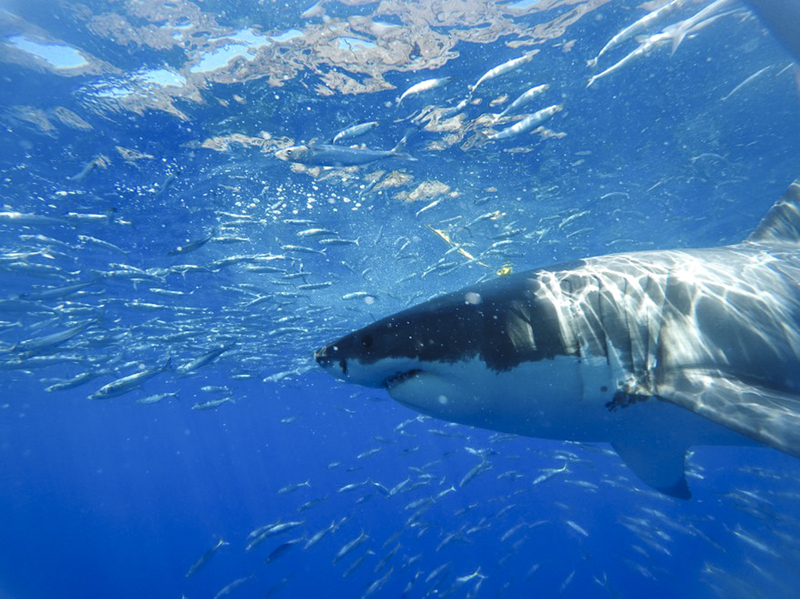 At 6:30 the next morning, the cages would open and we would have our first glimpses of what we had come for: Great Whites. The staff had explained that when sharks bite, their eyes roll back in their heads (and they are momentarily blind) to protect their eyes from potential attacks. 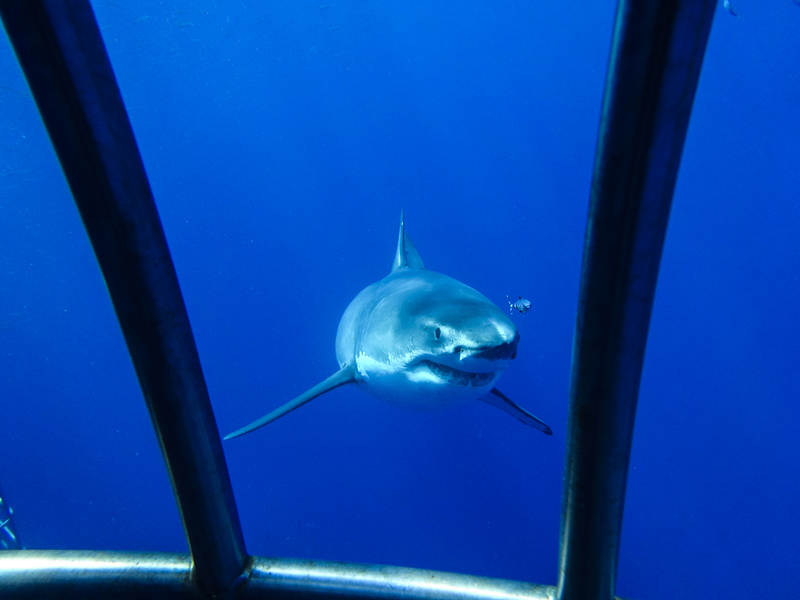 In my very first dive, a shark grabbed a bite of tuna and rammed head first into my cage, before regaining its bearings and swimming away. I was close enough to see the whites of its eyes! Later in the day, the sharks swam right up next to the cages, close enough we could stare deep into their deep blue irises. At one point we could see four sharks at once, and it’s only day one! Every day of this trip will definitely provide incredible once-in-a-lifetime experiences. As best said by one of the staff…..“JAWSOME! !” I grabbed a cup of coffee in the morning to help wake up. I didn’t need it. At the first glimpse of one of these amazing sharks coming after the bait I was wide awake and ready to jump in. From the start of the day we had sharks after the bait, even breaching to get a snack. The view from the submersibles was incredible. We didn’t know which way to look, we had so many sharks cruising around the cages. These sharks are indeed larger than life and take your breath away. All the video and stories in the world cannot do these sharks proper justice. And aside from the sharks–being surrounded in a snow globe of smelt and mackerel dodging hungry yellowfin tuna, the amazing night sky full of more stars than I have ever seen, the incredible staff and accommodations…..incredible. This trip has already fulfilled my bucket list wish list and its only Day One. Tag 3 – WOW – meh gits glaub’s nöd zsäge! Bin gar nüme usecho. De ganz Tag mindestens drü Grossi Wiisi Haie, bis zu acht uf einmal isch de Höhepunkt gsi. Mer isch gar nüme us em Wasser cho. Eifach nur WOW. Chäfig use, Toilette, chlises zwüsched Zäh und ab wieder is Wasser. Zum Glück simmer nöd tüüf am Tauche, so sind sehr langi Tauchgäng mögli. Sie händ mi hüt scho müesse us em Chefig usehole, ich wär immer no dinne… De dritti Tag im Chäfig, han aber no lang nöd gnueg. Für alli di Hai: Es lohnt sich uf jede Fall! Cools Boot, gueti Crew und Haie bis zum abwinke zum Teil 3 cm vor em Chäfig – WOW. Many times when you plan a bucket list trip/dream vacation in your mind you build it up and many times you might be disappointed. That is not the case with this trip, everything, and I mean everything has exceeded my best expectations. The crew is top notch and so friendly and helpful. The food is beyond outstanding, the ship is a delight and the shark diving cannot be described in one word (here are a few though: fantastic, awesome, phenomenal and the list goes on). We had planned this trip 3 years in advance and when you see 22 sharks and too many breaches to count what more can you ask for (and that is just the first day)!? To be able to pick a brain like Martin’s is great since there is so much knowledge to share and his very willing to share it (don’t forget to pick the crews’ brains too, they’re knowledge is also an enjoyable experience). If anyone complains about this kind of trip then they would complain about winning only 50 million in the lottery instead of 50.1 million. Thank you so much for the effort and time put in to make this such an outstanding trip and everyone in our group has already made plans to do this again, hopefully sooner than 3 years. Not only were we blessed with great weather, the shark experience was beyond words. Over 50 different sharks in 3 days and there was about a 2 hour segment that can only be described as the most intense situation I have ever been in (and I have been in a few). Wherever you looked there were at least 2 sharks, most times up to 5 circling the cages. One thing I must bring up is that we had a great group of people. Right off the bat, while in the hotel waiting to board, people were introducing themselves to each other and on the trip everyone talked with each other. No one hoarded anything film or equipment-wise and people were loaning GoPros willingly. This trip was the way it was because of the people on board. Everyone who came on this trip did it for the right reason. A big tip of the hat to Rob, from England, who will forever be known as “Shirtless Rob.” He is a man true to his word. He told Cindy if he could get on this trip he would wear a bikini and he did. He jumped into the cage in a bikini top which was awesome (even the sharks swam away for a few minutes due to the sheer awesomeness that is Rob). You are going to have the time of your life. Wow! I envy us who did this and I really envy all who will be doing this. Shaaark! A happy crew means a happy ship. How many times in your life have you had a long standing dream or ambition only to find the reality is a major disappointment and leaves you flat? Not so with this one. Welcome to the Shark Diver/Nautilus Great White Shark diving experience, the trip that genuinely breaks the mould and actually far exceeds any expectations or hopes you may have had had! This trip is about so much more than the sharks though, from the ever smiling and accessible Cindy who is your first point in Shark Diver, through to Martin, Mr Shark Diver himself, who is ever knowledgeable and always eager to share that knowledge and assist in any way possible to make your trip perfect, and on to the crew of the Nautilus UnderSea who, to a man, are the heartbeat of this boat and the right people in the right jobs. I expected this trip to be a bit like a camping trip on a boat! How wrong was I! From the beds freshly made in the morning, to the 5 star culinary skills of Felipe and the ever smiling faces and willingness to assist of all the deck crew, it has been nothing short of a luxury break. 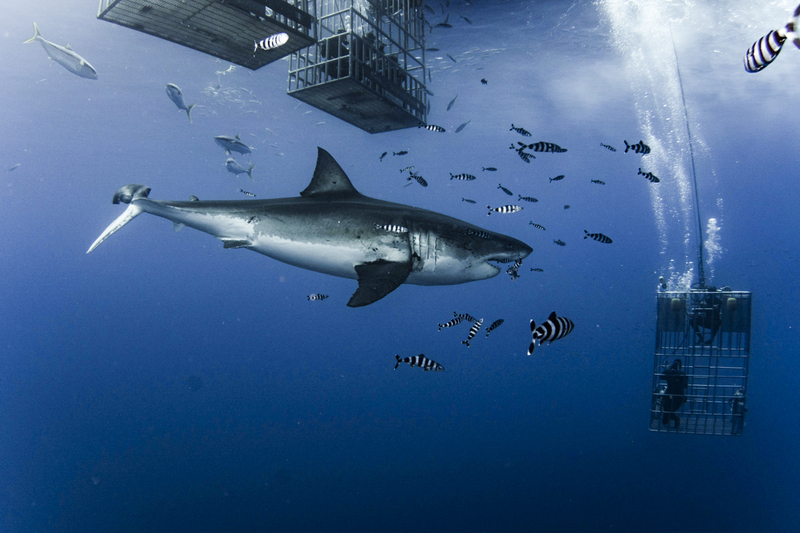 If like me, you’ve dreamt of swimming with these apex predators of the deep, I say do it! But I would give 2 bits of advice if you do, 1 make it Shark Diver you book through and 2, make sure you are on the Nautilus Explorer. Believe me you will thank me for this advice. Picturesque views surround you throughout each day. From the crashing waves to the sea life in a surreal suspension. In every direction your senses are treated to something new and exciting from the many fish swimming along side you to the bounding rocky top views of the island. The intensity of the first underwater shark sighting suppresses all other thoughts from your mind as you are mesmerized by what you are witnessing. You breathe in and hold your breath, so the bubbles don’t obscure you view which is followed by the exhilarating feeling that escapes your core as you remember to take your next breath. It is something that must be experienced first hand to gain a true perspective of this astounding creature’s awesomeness. These beautiful creatures of the deep will surprise you with their elegance and grace and then, in a split second, show you their vigor and strength and why they are the top of the food chain below. 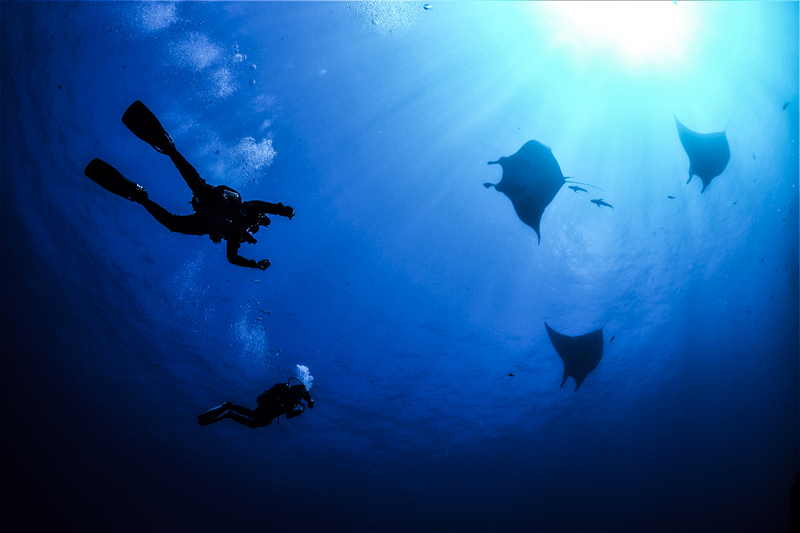 Minutes pass in an instant as all the sea life captures your senses underwater with so many vantage points to behold. Topping off this incredible journey under the sea, the crew are in full gear creating the most comfortable and inviting atmosphere of any trip you will experience. They work hard cooking, cleaning, teaching, and are jovial to the point you can’t believe they are at work. The meals are unbelievable and anything you need they accommodate to the best of their ability. The rooms are spacious and clean and are kept up throughout the trip. Hot showers and taco night are just two of the welcomed amenities on when you are 180 miles from shore. If you have never snorkeled or dived before no worries here. The crew will give you all the instruction and patience you need to get you in where the action is taking place, albeit in the safety of the cages. Towels, masks, etc. are all provided and will be fit to your comfort. Just bring a smile, a taste for adventure, and an appetite and you will not be disappointed!! All I can say is from the time you arrive at the boat it is nothing but amazing service from this wonderful crew. There is no lack of sharks. There was several different sharks every time we dove. Sometimes as many as 5 at a time swimming around us. Also, I thought coming here I’d get maybe 3 hours a day in a cage but day 1 I spent 6 hours in the cages and on day 2, 5 hours in the cages. The crew takes care of everything. They work from 630am when the cages open till 6pm when the cages close to get the sharks close to the cages. With these long days they are still smiling and telling jokes and really making you feel comfortable and welcome here. I am new to diving but these guys, within 5 minutes, had me feeling comfortable with the mask and regulator and I saw them helping some people out repeatedly so that they would feel comfortable. This is such an amazing trip and to be inches from 18ft great whites numerous times is far more than I could ever expect. Then you get out of the water and your food is ready for you just as you ordered. Felipe the chef is amazing and Osa the host does a fantastic job. I never expected the level of food as I’ve received here. I’m looking forward to bringing my family back. Martin taught us so much about great whites, it was amazing. Thank you Shark Diver and Nautilus UnderSea for an AMAZING time. I saw Jaws when I was about 5 years old. Far from terrifying a small child, the movie did exactly the opposite, which was to cement my love of sharks for life. We have been down with nurse sharks and rays, but I have been dreaming about taking this trip to visit my favorite of all the apex predators for the majority of my life. I figured when better to go, than for our 25 anniversary!?! I finally talked my husband into going with me (he previously joked that he was going to chum the waters and up my life insurance). I cannot describe how wonderful this experience has been, from top to bottom. The crew is helpful, friendly, and knowledgeable, the food has been top notch. The crew was extremely accommodating with special dietary needs and requests. Now, onto the diving. These divemasters are extremely helpful in making sure that you are properly fitted with comfortable gear and equipment. The guides are phenomenal at recognizing shark behaviors and making the most of it. We have seen so many sharks this trip. This is unreal. The guides are great at making the sharks breach above the waterline and remind you to have your camera ready at a moments notice, so you can capture the experiences. The sharks come extremely close to the cages, however, so keep your arms and legs and any other appendages in the cage! All in all, this has been an extremely memorable trip, and one that I would highly recommend. If you’re even a casual shark enthusiast, you will absolutely enjoy this experience! Thanks again to Martin and the rest of the crew for an extremely fabulous vacation. We will be back! Beyond compare! I have been on several white shark trips in the Farallon Islands, and this blew every one away. 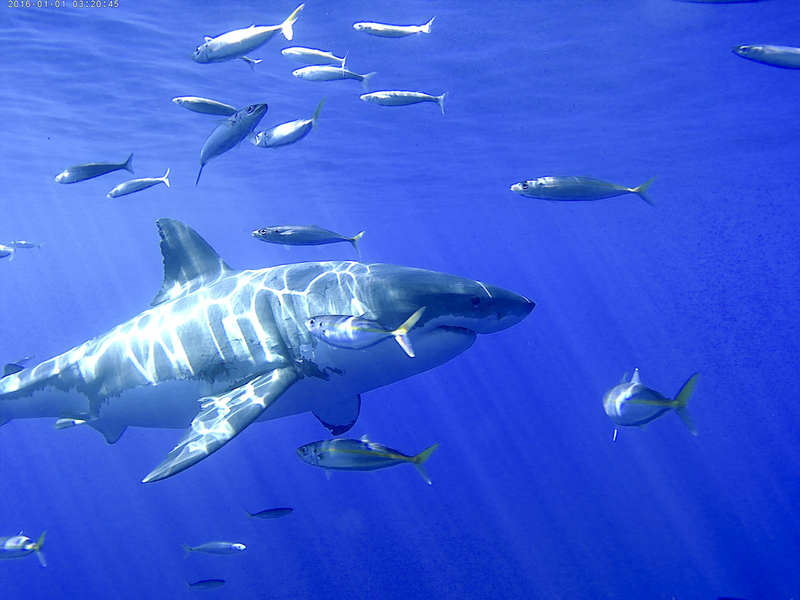 Compared to cold green water with low viz, Guadalupe Island was a dream. As a videographer I couldn’t hope for a better situation in which to gather footage. The warm clear blue water made it incredibly easy to time shots and get the sharks appearing out of the deep and right into my frame. The shark wranglers were not only great at their jobs, they were fun and made even people on the deck excited and part of the action. The crew set the shark family vibe from the moment we arrived and we quickly became a tight group. Every single crew member was friendly and caring, especially topside crew Juan, Toni and Roldolfo – who also shared science as the naturalist on board. They each made sure we had ample cage time and catered to our specific needs as divers raged from advanced to non-certified beginners. Chef Felipe did a great job with the food as well and Osa saved meals when we were enjoying cage time. But this trip was magical in no small part due to Martin our host and owner of Shark Diver who shared with us the citizen science in shark ID work and much about behavioral observations he has made in his years-long work at Guadalupe. Special thanks to Cindy for her role in organizing us from sign up through final goodbyes. I will definitely be back! From the time we were greeted by the crew with beverages and fruit to the time we disembarked the vessel was absolutely amazing. 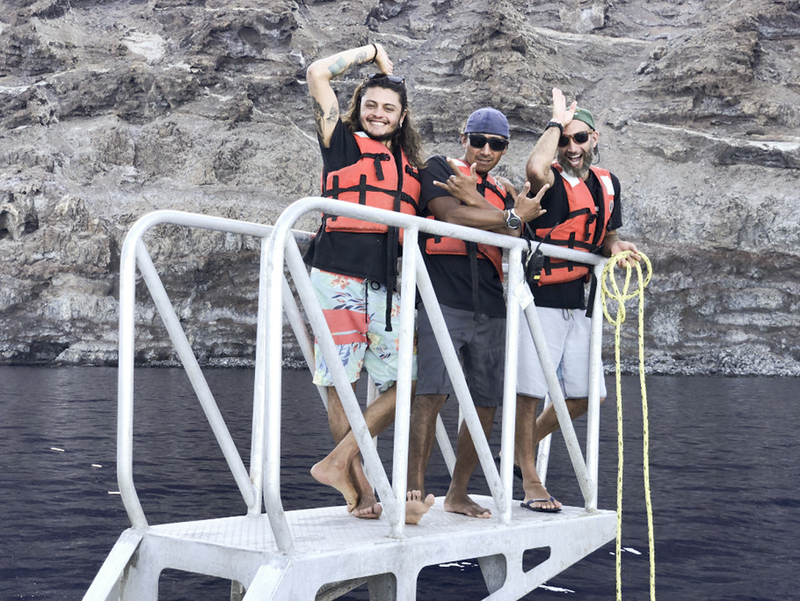 This is my 4th trip to Guadalupe Island, and this was far the best trip ever, not so much because we saw so many sharks, but the crew had so much to add to the trip. Lets start with the captain, who got us safely to our destinations without a hiccup. The chef made everything from scratch, even the cheesecake we had on our second night. Nothing was ever served on paper plates or paper cups, but rather glassware. The food was amazing. And who can forget our host Osa, who took the time to make our beds every morning, and even put a pointy tip on our toilet paper roll, I mean who does that? Who cares about little details like that?! And I love how he called me Madam, always with a smile. Our deck crew were amazing, and so funny. I will for months go to bed with the high pitch “SHAARK” in my head that they yelled every time a shark came by the bait. We had a hiccup with our toilets and our trusty engineer fixed it within a couple minutes, not one complaint from the crew about an inconvenience. Tony, who did an amazing job keeping us in line, put together a fantastic slide show and stayed up until 4am putting it together! The boat was always clean, and I felt such at home here. My experience here will never be forgotten, and will come back again and again. Thank you to everyone on this crew for making my experience here a memorable one. I grew up on the Fort Independence Paiute Reservation in the 70’s and 80’s. I am not certain that I had ever seen the ocean until I was 16 but somehow the movie Jaws put the fear of sharks into me. I am a retired Air Force officer and have been to war and have feared for my life many times, but not on this trip. I personally feel that sharks are beautiful, I witnessed their beauty to fullest extent possible on this adventure. Watching “Lucy” cruise by our cages and circle around under the boat was perfect. 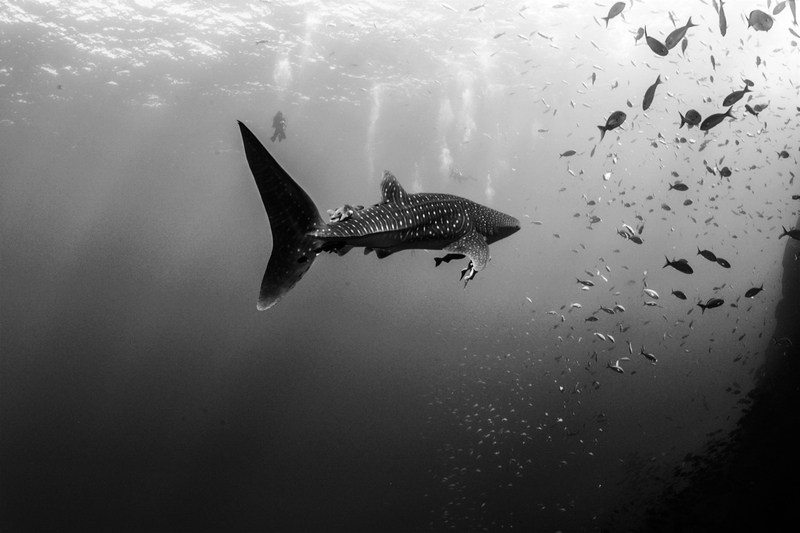 Photographing shark breaches, divers going in and out of cages, and enjoying the raw beauty of Isla Guadalupe made me feel as though we were the only people in the world. At least 6 or 7 times a year I am able to go into the mountains or desert to perform cultural preservation work for my Paiute Tribe, I enjoy being cut off from the world and this time I was privileged to do so in another part of this beautiful planet.